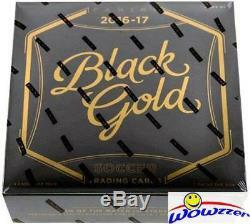 2016/2017 Panini Black Gold 8 Box Soccer HOBBY Factory Sealed CASE-16 AUTOGRAPHS. This is for a 2016 Panini Black Gold Soccer Factory Sealed HOBBY CASE! This Factory Sealed HOBBY Case has 8 Boxes! Each Box has 2 Packs and 4 Cards per Pack! Each Box contains Two Autographs for a Total of SIXTEEN(16) In this Factory Sealed HOBBY Case! Each Box contains Two Autographs! 2 AUTOGRAPHS - 2 INSERTS - 3 BASE CARDS - 1 BASE PARALLEL. The stunning Black Gold brand makes its debut for soccer. The biggest stars in the world are featured in both club and country in some of the most beautiful cards in the industry. Every pack of Black Gold features a card with an embedded metal emblem. Look for Stars and Man of the Match, both of which have short-print parallels that have print runs as low as 1. Panini continues to deliver autographs of the most renowned players in the world. Find autographs of Ronaldo, Messi, Neymar, Lewandowski and more. Celebrate the stars of the past in Vintage Gold, an autograph set that features 11 legends of soccer. IFA 365 Black Gold Soccer showcases some of the most beautiful trading cards the industry has ever seen. The 162-card base set features players in both club and country kits. On average, every box delivers three base cards and one sequentially numbered base parallel. Every pack of Black Gold features an insert card with an embedded medallion. Look for Man of the Match and Stars, both of which have parallels that are sequentially numbered as low as 1. AUTOGRAPHS/MEMORABILIA AUTOGRAPHS HOLO GOLD/GILDED SIGNATURES. Every box of Black Gold delivers two autographs. Find four unique autograph inserts that feature signatures of superstars from all across the globe. We stock a Huge Selection of Factory Sealed Boxes from every Sport! Plus the Largest Collection of Graded Cards in the World! Be Sure to Check out our 1,000? S of other Items for Sale. Wait to pay until all items have been won OR 7 days after oldest item was won. (Please Note - we are not open on the Weekends and Holidays). We will NOT list a lower value or mark orders as gifts. We answer all emails within about 24 hours, Monday through Friday, and work to resolve all problems as quickly as possible. Unless an item is damaged, it generally needs to be in the condition it was received, either undamaged or factory sealed, to be eligible for a return. Get business information that counts! - Vendio Counters are active content free. 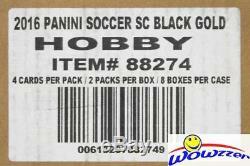 The item "2016/2017 Panini Black Gold 8 Box Soccer HOBBY Factory Sealed CASE-16 AUTOGRAPHS" is in sale since Wednesday, March 7, 2018. This item is in the category "Sports Mem, Cards & Fan Shop\Sports Trading Cards\Soccer Cards". The seller is "wowzzer" and is located in Irvine, California. This item can be shipped worldwide.